In many areas around North America, we will be experiencing brief or extended thaws from now until the end of winter. During a thaw, you'll be able to look over the lawn and see the areas that are bare or thin, or have been damaged by dog activity. Normally, you might make a point to seed these areas in the spring. But seeding is work and time consuming, and you have to baby the new seed along. So why not try something different and much easier this year: mid-winter seeding. With this type of seeding you let nature do the work and you reap the benefits a couple months later. 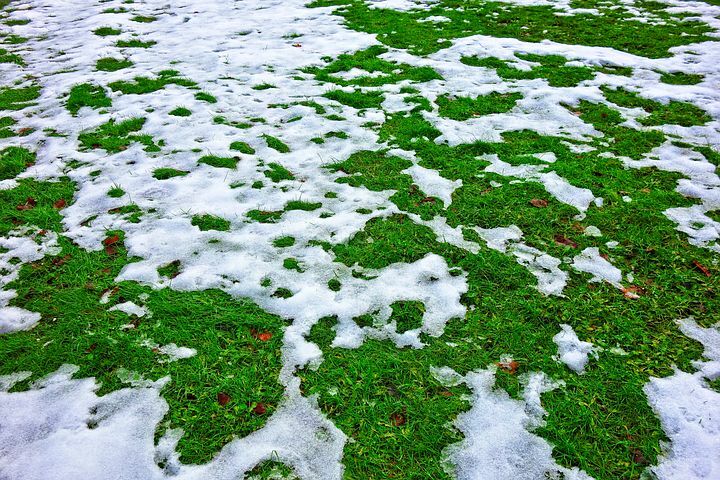 Here is all that you need to know: when the snow melts during a thaw and you can see bare spots or thin areas of lawn, simply sprinkle some grass seed fairly heavily right over the soil or thin grass areas, and that's that. If the soil is a little bumpy due to dog or foot traffic when wet, you can step on it first to press it down and level. Over the next month or two the freezing and thawing of the soil along with the water penetration from snow and rain will work the seed into the soil. It will be deep enough to keep it moist and protected. This seed should sprout by mid-spring. It may not be quite as effective as conventional seeding, but it is fast, easy and worth a try, especially if you have some leftover seed sitting around that should be used before it is too old to germinate. Make sure to hit the seeded areas early in the year with All-In-One for LAWNS. This will help the seed sprout faster and will add microbes and trace elements that are particularly good for fast root development. Winter seeding should not be done on lawns with a thick thatch layer since that would prevent the seed from reaching the soil. Also, there might not be any point to winter-seed low areas or other situations where you are going to need a lot of soil to build it up. But if you have a dog that is muddying up the yard then winter seeding may be the only way to seed the lawn without blocking it off from the dog in the spring.